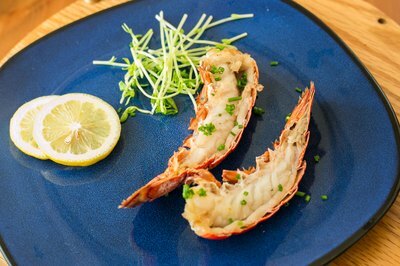 The secret to cooking lobster tails is to cook them only until they're just done, because lobster can be tough and chewy if overcooked. When the shells turn red and the meat is white, remove the lobster to a serving platter. Popular methods of cooking lobster tails include boiled, steamed, grilled and baked. Boiling and steaming cook the lobster most evenly and produce tender meat. Defrost the lobster before cooking, if necessary. Cooking frozen lobster requires a longer cooking time and the outside meat overcooks before the center is done. 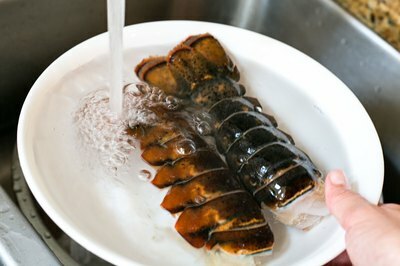 Defrost the lobster tails in the refrigerator for 8 to 10 hours, or place them in a bowl and run cold water over them. Defrosting in the microwave can start the cooking process and result in tough meat. To boil lobster, you need a large pot of salted boiling water. Allow about 1 tsp. of salt for each quart of boiling water. Thread your lobster tails onto a wooden skewer to prevent them from curling up while boiling. Boil the lobster tails for 1 minute per ounce of weight or until the shell is red and the lobster meat is white. Remove the lobster from the pot and split the soft shell on the underside down the center with kitchen shears or a sharp knife. Serve immediately with butter and lemon as desired. 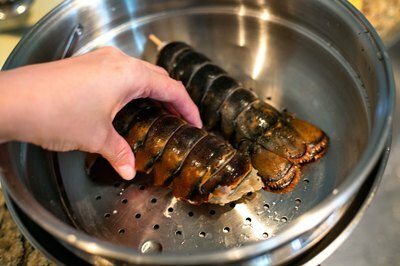 When steaming, lobster tails tend to curl, so you will want to insert a wooden skewer for this method, too. Bring 1 to 1 1/2 cups of water and 1 tsp. of salt to a boil. Place the skewered lobster tail onto a steaming rack over the boiling water and cover with a lid. Steam the lobster tails for approximately 1 1/2 minutes per ounce. Serve immediately. 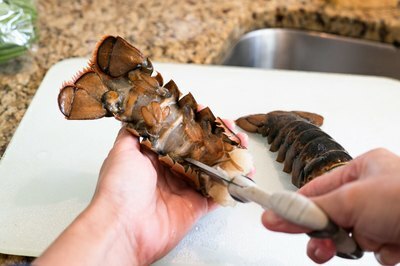 Prepare lobster tails for baking by splitting the soft shell on the underside of the tail down the center with kitchen shears or a sharp knife. Preheat the oven to 400 degrees F and place the lobster tails on a baking sheet. Baste the lobster with melted butter. Wrap large lobster tails in foil to prevent drying out and bake for 8 to 10 minutes until done. 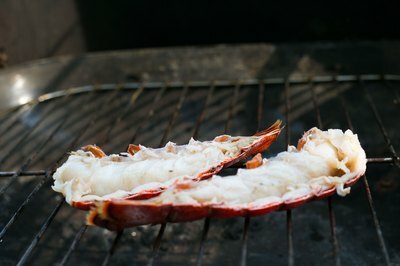 To grill lobster tails, start by skewering and then boiling them for 3 minutes until partially cooked. Slit the soft under-shell lengthwise with a sharp knife or cooking shears. Place on a hot grill, meat side up, and baste with butter or olive oil. Season as desired and grill for 7 minutes or until done.